Traffic jams - the main problem of railways. In order to solve it effectively, the knowledge of its nature is required. The essential principle of the traffic jam is a line loop (direct or indirect). 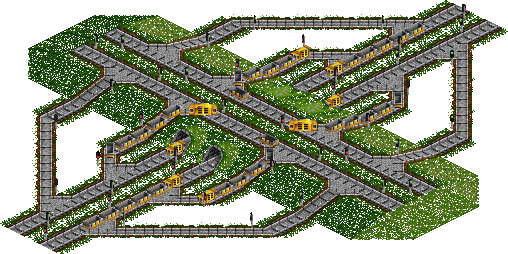 A loop is group of rail track, which allows trains to move through it. When trains fill the whole loop, traffic jam occurs. First type of traffic jams is loop based static traffic jam. Static means, that trains are locked with one way signal from the back side, what prevents train from going back, and with red signal from the front, because of the other train on the loop. Schema 13.1 is an example of such a traffic jam. Second type of traffic jams is indirect-loop based static traffic jam. In this case, where is no loop, which trains can fill. But the locking mechanism is the same - a one-way signal behind a train and a red signal in front. Schema 13.2 is the example. The role of a loop is played by a group of lines of different ways and their crossings. That's why the number of crosses has to be reduced. Static traffic jam can't melt away themselves. Only human intervention can unlock trains in jam. They can be discovered by founding trains with negative income in trains list. Third type of jams is dynamic jams. This type of jams occurs on loops with depots. The origin of dynamic jams is the fact, that the last service is updated at the moment of the trains entrance in depot, not departure from depot. This means, that when a train waits one servicing interval inside the depot, it will go to depot when it finally comes out. This can lead to trains crowd near and in depot (schema 13.3). In this case, trains use availably place (on station, line-blocks or in depot) by turns. Some train can leave the jam, some can be caught in a jam. Sometimes dynamic jams can melt away themselves. Dynamic jams can be fixed by using go-to depot ability from TTDPatch 1.9. 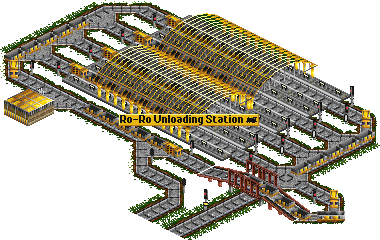 Adding depots to train's order list prevents trains from undesirable searching for depots, that prevents train crowding near depot.